The Circle (Sammy Hagar, Michael Anthony, Jason Bonham, & Vic Johnson) w/ Collective Soul, Andrew Hagar. I Love Sammy. It was a awesome concert with friends. Was a fantastic show. Andrew Hagar was cool. Collective soul rocked it as swell and ZZ top was awesome. 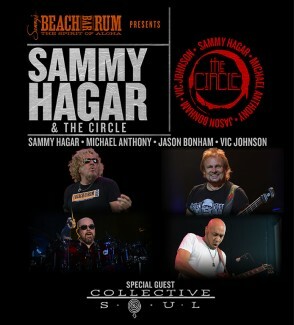 Sammy Hagar and the Circle, well they just killed it. I will definitely be seeing the Red Rocker again!! Nice meeting all the Red Head fans around us!! Seems appropriate to point out that ZZ TOP was there also. Great show! If you have floor tickets in St. Louis do you stand the whle time? I am intersted in your tickets. Do you still have them? Can't wait! Annual event Sammy Rocks! The Circle with ZZ Top....it doesn't get any better than this! 2 row E right side. Email or reply and I will check back each evening. Super excited!!!! Been to see Sammy many times and this is like a dream - because it is on my 60th birthday!!!! Plus KSHE95 (favorite radio station) is celebrating 50 years! And Sammy will be 70! Let's all celebrate!!!! Would love a meet and greet..if anyone knows how to make this happen, please please let me know. Great warm up for RLC VI!!! Great warm up for RLC VI!!! Row C center!!! 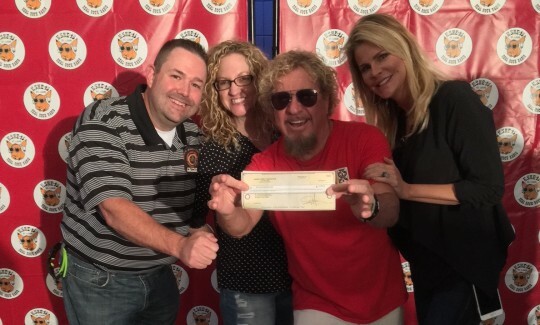 Alright Alright Alright sammy rock fair st.louis now KSHE's 50th! Class act. Heading to cobo for bay party too! What is the VIP presale password???? This will be our Cabo warm-up concert/party !!!! Who could ask for anything more... Sammy in St. Louis, then St. Louis in Cabo....woo-hoo !!!!!!! This IS kshe's 50th bday bash! woohoo!!!! ZZ Top too! last show before Cabo! CANNOT WAIT!!!!!! Sammy is always a fun show. Red Rocker still ROCKS! So does Mikey! I can't wait either Redheads! Rock on "Circle". I cannnot wait!!! This show is going to ROCK! I would be so excited to meet Sammy!! He has been my favorite for ever!! My al time dream is to meet him! I've literally been a fan all my life, and meeting Sammy is #1 on my bucket list. Fate has intervened and my 30th birthday is September 30th which happens to be this concert! So excited! If anyone knows of a way to get a meet and greet with Sammy please let me know! Are ticket prices posted yet? Planning on being there. Although last time I had tickets, I had to miss concert due to being in the hospital. So will keep my fingers crossed.